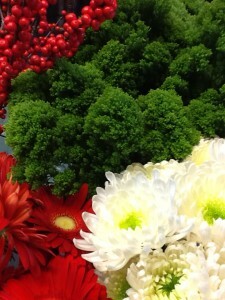 Fresh holiday seasonal flowers put together by one of our talented designers using only the freshest and finest blooms. A fantastic Holiday gift! 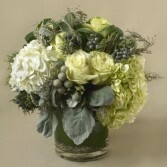 White hydrangeas, ivory roses, green and white kale and green hypericum berry help bring in the winter colors for this arrangement. And just the right accents of decorative silver items add the perfect touch. Snow white hydrangea, roses and other white seasonal flowers come together in perfect harmony. Absolutely perfect for all occasions.